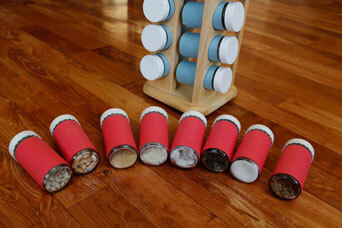 My 3 year old was not very good at doing these Montessori sound jars when I first made them, but I’m hoping that as he gets older, he’ll learn to distinguish between the different sounds. The idea is that you have two sets of jars (blue and red, in my case), each filled with the same objects (like rice, rocks, beans, etc.) The child would start by picking a red jar for example, then shake it, listen carefully to it, and try to find the blue jar that makes the same sound. Since I left the bottoms of the jars uncovered, the child could check to see if they guessed right by looking in the bottom of the jars to see if the contents match. Cost: For me, this was a very inexpensive project, because I got the spice rack for cheap at a garage sale and filled the jars with items I already had around the house. However, a brand-new similar spice rack (Affiliate Link) on Amazon is not cheap at all, so the cost of this project can vary widely. Measure the height of the jar and cut rectangles out of the construction paper such that they can be wrapped around the jars to hide the contents. Make half the rectangles one color and half a second color. Glue one rectangle onto each jar. For each item (rice, rocks, etc. ), place an equal amount of that item in a jar of each color. 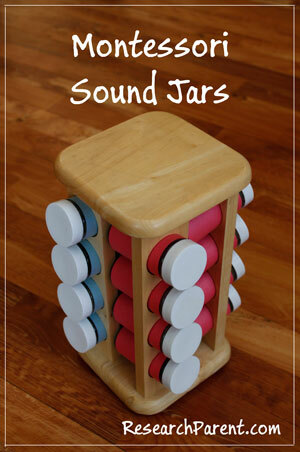 In the end you should have a matching set of sound jars, with one set covered in one color and the second set covered in a different color. This is such a wonderful learning activity! My son may be a little young for it too, but would love to try it. Thanks! Yeah, my oldest is 4.5 now and I feel like 8 pairs of jars is still a little much for him. He can do 3 or 4 pairs of distinct sounds easily, but gets overwhelmed when he tries to sort all 8 without help. He usually makes a couple mistakes, but they are pretty tricky even for me. Some of the sound differences are really subtle. Great activity for senior care and people living with dementia also.